Kate Linnea Welsh: Christmas cookie guessing game! So, late last night, on Twitter, I sort of accidentally started a contest. I've been tweeting running tallies of my Christmas cookie baking, and last night I said "Huh, no idea what the final total will be. Guesses?" And then I decided I should give a prize to whoever guessed closest. And then I decided I should put this post here so those who weren't on Twitter at midnight on a Wednesday night could have a chance too. SO. I have made 192 cookies so far. I will make 8 kinds of cookies. I'll make two batches of some of these. 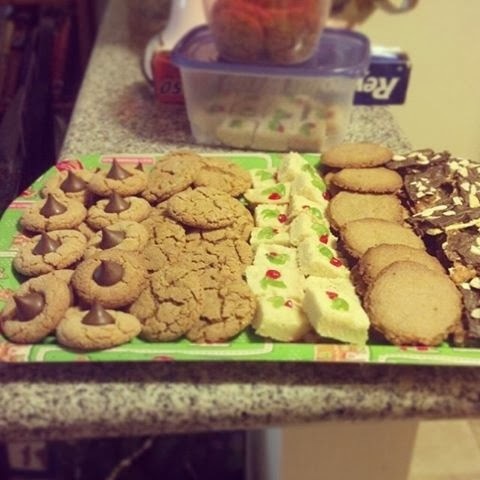 The first six dozen were for a cookie exchange. With the rest, I'm doing cookie trays for three events, plus some family favorites to just have around the house Christmas week, plus maybe a few small cookie boxes for friends. I will be done by Sunday night. The prize: Whoever guesses closest can pick either a $10 online gift card (to Amazon, iTunes, or another service/site of your choice that's logistically reasonable for me) now OR a package of homemade cookies sent to you in January, because no way will I have time to bake MORE and get to the post office before Christmas. I'm gonna go with 416.